A wage garnishment occurs when money is deducted from the compensation of an employee (i.e., a salary) due to an order from a court. These garnishments continue until the total debt amount has been paid off or plans are made to pay it off. Garnishments can be taken for many different kinds of debt, including taxes, child support, defaulted student loans, and unpaid court fines. Other types of procedures for garnishments include IRS or state tax collection agencies that levy for unpaid taxes and federal garnishments for non-tax-related debts owed to the government. Video: What is Wage Garnishment? Title III of the Consumer Credit Protection Act places limits on how much of an employee’s earnings may be withheld for garnishment purposes. Each person receiving personal earnings (like salaries, commissions, and wages) is protected by this law. The amount of earnings subject to garnishment is determined by the percentage of their disposable income. Certain deductions are also kept exempt from being included in the calculation of an employee’s gross income. These deductions include expenses for health and life insurance, donations to charitable causes, and contributions to retirement savings plans. In regards to taxes, the IRS must fulfill 3 requirements before being legally able to take out a garnishment on a person. 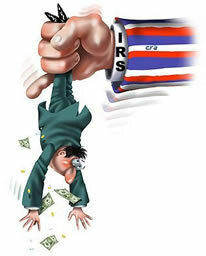 First, after sending a Notice and Demand for Payment, the IRS must assess the tax. Second, the taxpayer must default in the payment of the taxes, either by neglecting or refusing payment. Third, at least 30 days before instituting the levy, the IRS must issue a Final Notice of Intent and Notice of Your Right to a Hearing. When private debts are concerned, all wage garnishments are implemented with debt collection lawsuits. Examples of private debts are credit card bills, personal bank loans, medical bills, and student loans. In order to garnish your wages, a creditor has to get a judgment against you from a judge. A creditor cannot garnish your wages and freeze your bank account(s) at the same time. Typically, the rest of your wages are exempt from this kind of debt collection. You can be garnished for 2 different debts simultaneously. However, this amount can only equal a maximum limit determined by your financial situation. Employers cannot fire employees for a first wage garnishment, but they can for any additional garnishments after that. Despite the negative situation of being faced with a wage garnishment, it is possible now to devise a settlement plan with the court involved when you are faced with this type of situation. Reaching such a settlement in this case is one way of dissolving the existing court judgment. Forming this kind of agreement effectively stops the garnishment from continuing to be raised against a person. A number of states at present do not allow garnishments to be brought against individuals unless the matters are related to taxes, restitution for any crimes committed, child support or alimony, or federally subsidized student loans. The states that do no allow those kinds of garnishments are North Carolina, South Carolina, Pennsylvania, and Texas. The U.S. Department of Labor fact Sheet clearly sums up federal regulations regarding wage garnishment.